1/2 price discount for Sunday class if attending classes on Saturday too! Deadline: Monday, February 11, 2019. Early enrollment is recommended! Attire: Nice casual attire. 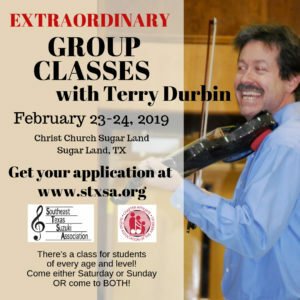 If you have one, wear your studio t-shirt, black STXSA t-shirt or other violin or music shirt. Violin Classes: Please arrive 15 minutes early for your first class. 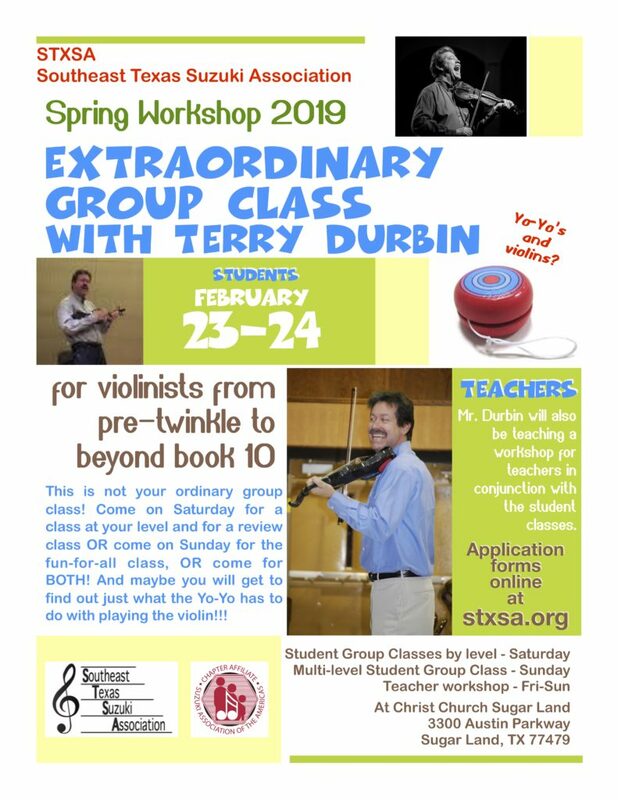 The workshop is open to all violin students from pre-twinkle level through/past Suzuki Volume 10. Student's teacher MUST be a member of STXSA. Terry Durbin is a most exciting, dynamic and motivating group class teacher for students from pre-twinkle thru college. This will not be any ordinary group class. It will be EXTRAORDINARY. You can see Terry Durbin in action on YouTube. Students are encouraged to register for multiple classes. Participation in review level classes is encouraged. You may attend either only Saturday, only Sunday, or both Saturday and Sunday classes. All music will be memorized. A parent is expected to attend with every student. Siblings and family members are welcome to attend. Students are encouraged to participate in the concurrent Chamber Music workshop; schedules will be accommodated for those participating in both workshops. 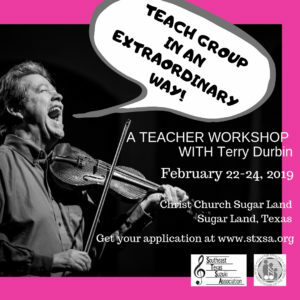 Fee: FREE for all STXSA Teacher Members! Want to become a member? Join STXSA here. To help us with planning, please feel free to scan and email all applications and mail your payment. Attire: Casual. If you have one, wear your STXSA t-shirt. Please encourage your students to register for multiple classes. Participation in review level classes is strongly encouraged. Teachers will pre-pay online for the teacher luncheon from Jason’s Deli. Please check the box below if you would like to receive the email from Jason’s Deli to order lunch. If not, you may bring a sack lunch. Please print the Spring Workshop Teacher Application for more information. 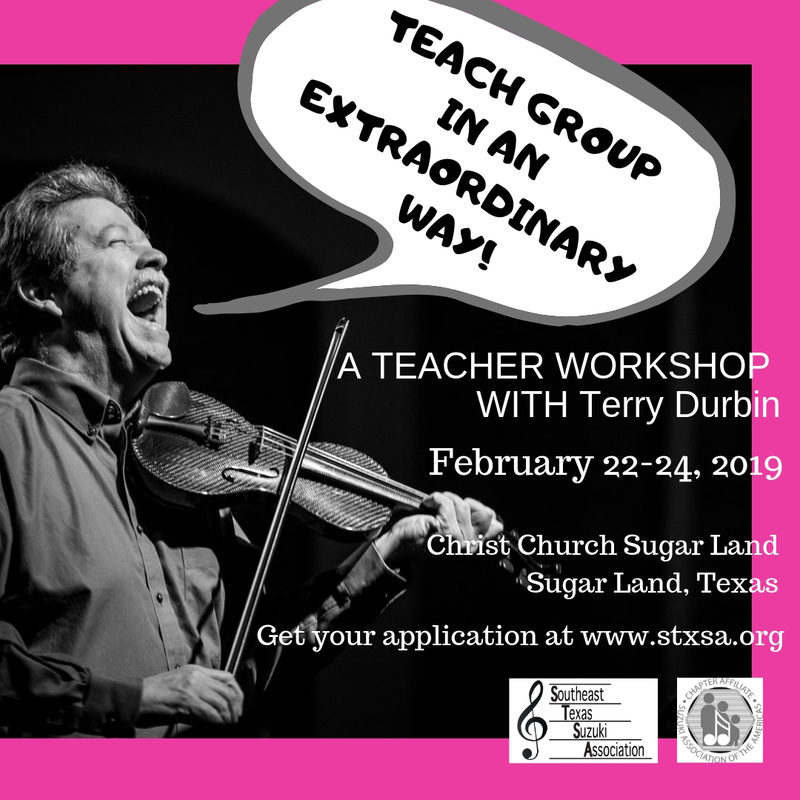 Terry Durbin will wow you, shake you up, and turn your idea of group class upside down! His dynamic teaching style, effective for the youngest pre-twinkler through college age students, captivates students and teachers everywhere. 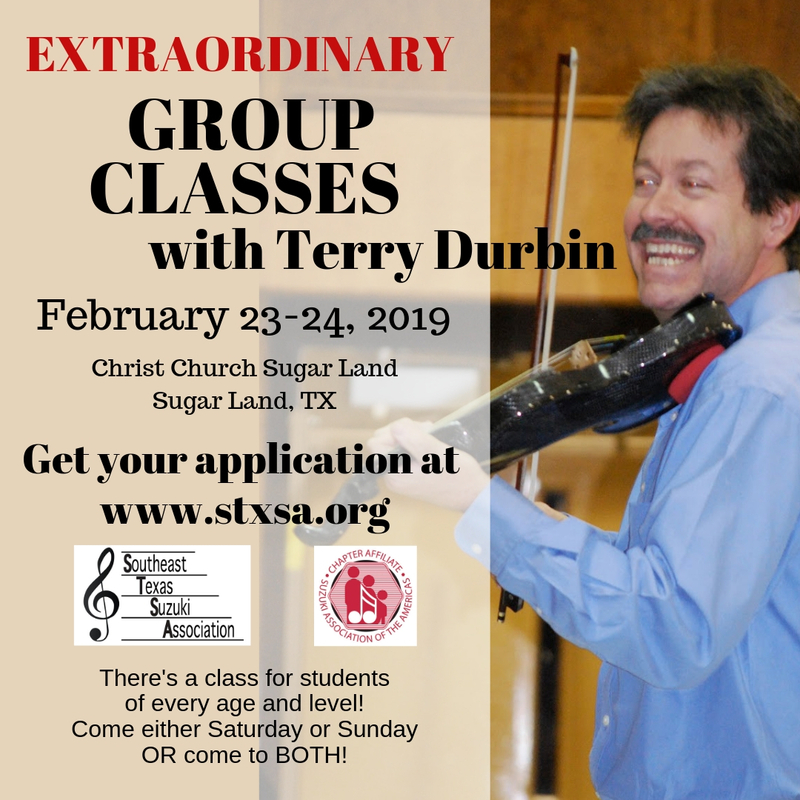 Learn from Mr. Durbin in a teacher lecture format and also through observation of specific level violin group classes and a multi-level group for students of all ages.